shine brite zamorano: charlie 5. Figure 5 in Gold is one of Charles Demuth's most famous paintings. It may not appear to be so, but it is actually a portrait of one of his friends, the poet William Carlos Williams. Obviously not a physical likeness, it is based on imagery that is from one of his poems called The Great Figure. I decided to use this painting as inspiration for the 3rd grade classes first project with me this year. They had spent the first 4 weeks of the year with one of our other art teachers, Ms. Pothier and with her they focused on creating different values and making 3d space by making things smaller and smaller. They applied these concepts to projects while examining the work of Van Gogh, so I thought it would be interesting for them to apply these concepts to something that was very different visually. That way they can see that 3d space can be created both in work that is more realistic and in work that is more abstract. 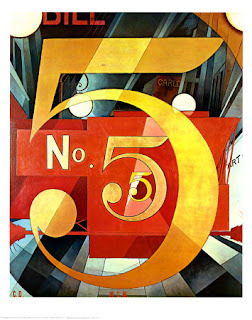 We discussed what was happening visually in Demuth's painting as well as where he got the idea for this "portrait". Before I told them how it actually was a portrait, I had students offer their own interpretations of the painting. Students in each class came up with some pretty good ideas based on very little information provided to them. I emphasized his use of contour lines to define the edges of shapes and his repetition of the number while making them smaller and smaller to create some depth in the image. I deviated from Demuth's color palette and introduced them to warm and cool colors in nature and art, so that students could use them to make certain parts of their image stand out against other parts. When I showed them an example that I did, we also discussed how to turn a flat shape into something more 3d. By pressing hard and then more softly and softly, you can turn a circle into a sphere. While doing so with color, you make tints of the color because it mixes with the white of the paper. They had practiced shading like this with graphite in Ms. Pothier's class so they were familiar with the idea. Before starting on their own versions, I emphasized to the students that they must have a reason for the number they were going to draw, just as Demuth did. It could be how old they are, how many people are in their family, their favorite number, etc. This project took us about one and a half meetings. Fantastic! I have always loved WCW and his poetry and have truly been trying to come up with a way for my little ones to use poetry in the art room. Thanks for the springboard - you are inspiring!